On February 3rd, 2018 join us at 6 PM for the opening of the exhibition “Silent Noises” by the artists Orlis Vathi and Tanja Laeri tek Ditart, Tirane, which will be open to the public until February 15, 4-8PM. Tanja is an international artist, currently at residency with Ekphrasis Studio in Tirana for the Reef Refigium II project, and has exhibited, worked for several projects in Switzerland, Germany, Morocco, and Albania. 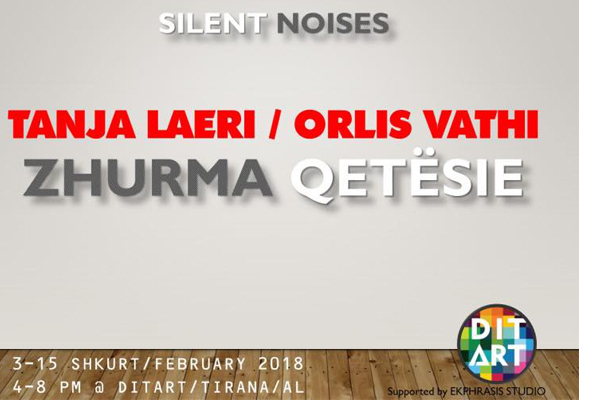 “Silent Noises” is also explored by Orlis, an artist who has lived, exhibited, curated several artistic events, in Tirana. The artists discuss the relationship between Space and Individuals in the city. The individual is presented often, intentionally or not, as a by-passer and testimony of the changes. Through the physical and emotional experience of space in the city, the object is crucial in documentation as it dominates with its presence. The object, shapes and “noises” become the expressing language of the artists’ works. Curated by Blerina Berberi & Kevin Tummers.